Working Around Moving Traffic: Are You At Risk? Workers who work on the roadway or near moving traffic are exposed to hazardous workplace conditions that put them at high risk of serious injury and death. In the United States, over 20,000 workers in moving traffic zones are injured or killed each year. In highway construction areas, at least three people die each day due to work zone injuries. In 2011, 590 roadway workers died. In 2014, the death rate jumped to 669 and rose again to 700 in 2015. The majority of injuries and deaths are caused by vehicles and objects that strike workers. Between 2011 and 2014, there were 80 worker fatalities caused by motor vehicles hitting workers while they were performing routine job tasks near moving vehicles. Crushing accidents and vehicle collisions also account for a high number of serious injuries and fatalities. Roadway workers are often hit by cars moving at high speeds or crushed by cars that pin them down or throw moving objects into their path. According to the National Highway Traffic Safety Administration (NHTSA) accident statistics, construction workers, roadway workers, traffic engineers, and public utility workers are especially vulnerable to the dangers of working around moving traffic. In 2015, more than 40 percent of roadway workers reported that their work zones had been struck by a moving vehicle at least once during the year. Other workers including police officers, street cleaning crews, grounds, and building maintenance workers, school crossing guards, delivery drivers, and parking and toll attendants are also at high risk of injury from moving cars. NHTSA reports show that approximately 19 percent of worker fatalities occur on or near busy urban streets and freeways, while 25 percent occur on more rural roads and highways. Workers who work the night shift or in bad weather conditions like fog, rain, sleet, and snow are at higher risks of life-threatening injuries and deaths due to high vehicle speeds and poor driver visibility. Although roadway workers who work at night are provided professional lighting equipment for their work zones, drivers who are speeding, drunk, impaired, drowsy, or distracted often ignore or don’t see the lights and other warning signs posted near work zones. To prevent injuries and deaths, the Federal Highway Administration and OSHA promote workplace safety zones for all types of workers who work near moving traffic. In workplace safety zones, traffic is usually controlled by traffic signs, barriers, and flags that alert drivers of nearby workers. 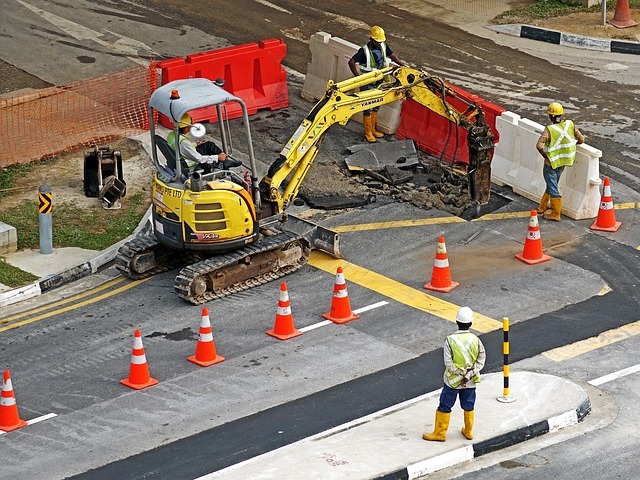 Approved traffic control devices, including orange cones, barrels, barricades, and signposts are often used inside work zones. Traffic control devices, signals, and message boards are used to instruct drivers to follow specific traffic paths that take them away from workers in work zones. Protective Work Zone Equipment – Signs that say “REDUCE SPEED AHEAD,” bright orange cones, crash cushions and collapsible barriers, concrete or steel barriers, water barrels, sandbags, and truck-mounted signs are used to slow down drivers and protect roadside workers. Flaggers – In some traffic work zones, flaggers dressed in high visibility, fluorescent clothing are used to alert passing drivers to danger. Flaggers often use “STOP/SLOW” paddles, lighted paddles, and orange flags that are visible for at least 1,000 feet in any direction. Flaggers must be trained and certified in the use of authorized signaling methods. Lighting – Traffic work zones and flagging stations have professional lighting equipment that helps to protect workers during the night and early morning hours when visibility is poor. Lighting for equipment operators or workers on foot must be at least 5 foot-candles or greater. Where available lighting is not sufficient, flares or chemical lighting is often used. National Work Zone Awareness Week occurs every year in the spring as roadway construction projects begin. The 2019 National Work Zone Awareness Week will be held April 8 – April 12. This year, NHTSA will launch the annual safety program in cities across the country to promote safety and prevent accidents and injuries for all workers who work around moving traffic. Other organizations including the Federal Highway Administration (FHWA), the Federal Motor Carrier Safety Administration (FMCSA), and the Occupational Safety and Health Administration (OSHA) will sponsor the safety campaign to raise awareness of roadway safety near work zones. National Work Zone Awareness Week was first established in 1999 to urge motorists to obey speed limits and use caution while driving through roadway work zones. This year’s campaign slogan “Drive Like You Work Here,” is aimed at all drivers who must travel through roadway work zones. Although workers who work near moving traffic are at great risk of injury and death, workers are not the only people in danger. Accident statistics show that drivers and their passengers account for four out of every five work zone fatalities each year.